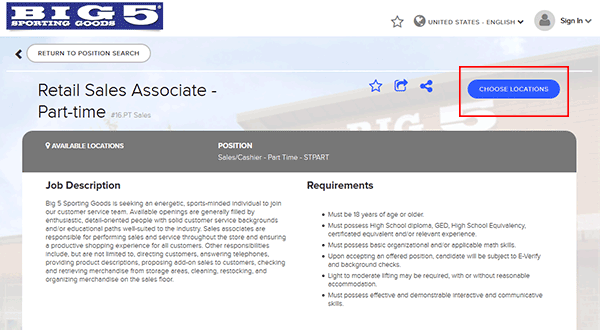 There is currently no official Big 5 Sporting Goods job application available. However applicants can search/apply for jobs by going to the company’s careers website. Read the guide in the below section to learn how to search and apply for jobs on the website. 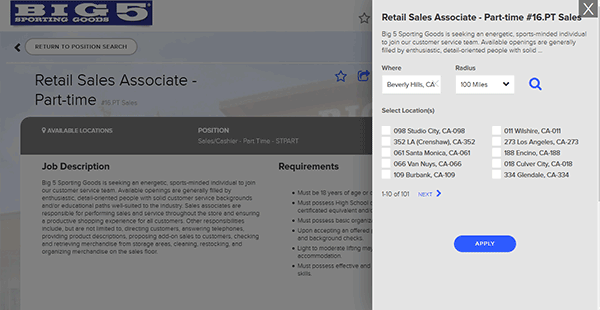 In-store, corporate, and distribution center jobs can all be applied for. About the Company: Big 5 Sporting Goods is an American chain of sporting goods stores based out of El Segundo, California. The company was founded in 1955 and currently has over 400 locations. Step 1 – Click here to open the careers site in another tab or window. 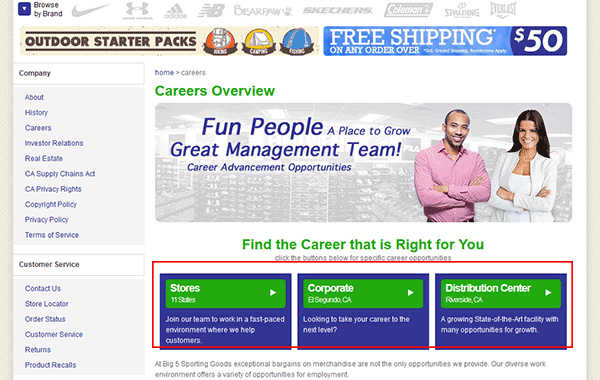 Step 2 – Click whether you want to search for in-store, corporate, or distribution center jobs. 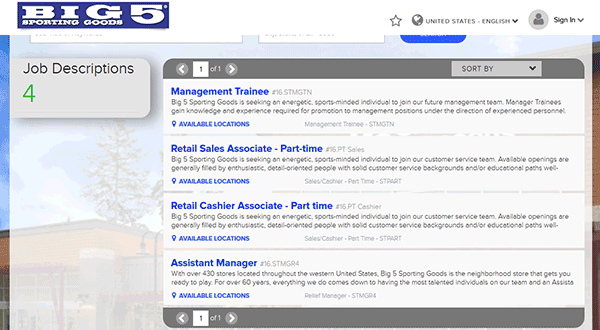 Step 3 – All of the current openings will be displayed on this page. Click the position title of the job you want to apply for. Step 4 – On the job description page click the “Choose Locations” button. Step 5 – Check the locations that you want to apply to and then hit the “Apply” button. Step 6 – Sign in to your account, or fill in your email address/password and then press the “Create Account” button. Step 8 – Click the blue arrow button to move to the next section. Step 10 – After the form has been completed and all of the required information has been filled in you will be able to submit the application for processing.